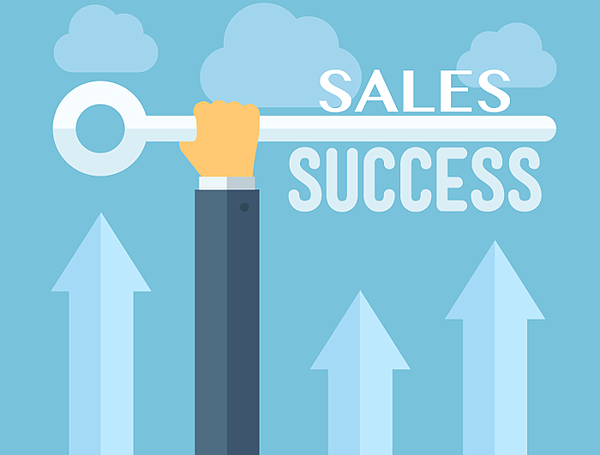 To be a successful salesperson, you need to be knowledgeable, professional and prepared. You should study the competition, know proposals like the back of your hand and you know how to be clear and compelling when it comes to discussing your products and services. Successful salespeople know how to do their job and do it right. Successful salespeople also understand how important the sales team is to the scalability of a company. Since the entire company depends on you to deliver, you have a lot of pressure coming down on you. How do you move past the pressure and become a productive and accomplished sales professional? In today’s post we are going to really get into the best ways you can become a more productive team and ultimately achieve sales success, in 3 simple steps you can start implementing today! One of the best ways to become more successful and productive is to leverage your resources. What better way to deliver the worth of your company than through various outlets and resources? Our team is our best asset here at New Breed, so we are constantly involving different members of our team to deliver a fresh new perspective, and add additional value. Your prospects will feel delighted that you have made this a team effort to deliver a roadmap to their success. If you’re an inbound marketing company (like us), invite a member of your content team to talk about the attract phase (content is king after all); invite a member of the creative design team to talk about the benefits of a responsive, optimized design. And so on...Every member has something new and exciting to bring to the table, and ultimately contributes to the scalability of your prospect's success. Also, think about everything you need to deliver in the early stages of engaging with your prospect. Bringing in your team (the big guns, if you will) saves you time, ultimately resulting in a more productive meeting. You will also be able to give your prospect a great perspective of your organization and they'll get an inside look into who they will be working with and who will be helping them grow their business. This will build your credibility and create a more personalized experience for both your team and your prospect. Listening is not only polite, but it can be extremely beneficial to your productivity. You of course don’t want to be completely silent; after all, you have a lot to inform your prospect on! However, let your prospect lay everything out on the table upfront. This will allow you to identify their specific expectations, how you and your team can exceed their expectations and you’ll also have a true understanding of their company and revenue goals. Instead of scrambling to get last minute information that you should have collected at the start, listen carefully to your prospect and take detailed notes on expectations and promised deliverables. This will help you to be and stay productive, ultimately creating a seamless experience for your prospect and driving sales success. So you have leads but now you don’t know what to do with them – say what?! Once those leads start rolling in you need to be productive and active. How are you going to do that? With a proper game plan of course! If you didn’t know this already we are huge fans of our friends and inbound marketing partner, HubSpot. 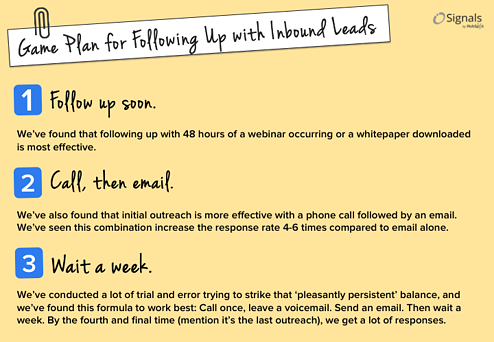 So we would like to feature one of their best practices / 'game plan' for following up with inbound marketing leads. Having proper strategy keeps you organized and efficient, leaving you more time to stay on top of other important deadlines / priorities. Ultimately creating a more productive experience internally and externally. Have any tips or comments you would like to share on staying productive and on top of your sales game! We would love to hear from you!